Residential construction involves the building and selling of both individual and multi-family dwellings. These residential dwellings may include single-units, manufactured housing, such as mobile homes and pre-built houses, duplexes, quadplexes, apartment buildings as well as condominiums. In 2018, the New York-Northern New Jersey-Long Island region had contributed to commercial building and multifamily housing starts amounting to about 16.1 billion U.S. dollars, spending for new residential construction also continues to rise in the United States. In addition to homebuilding, home renovation also forms a major part of residential construction. Residential building improvements in the United States were estimated to have an annual value of over 200 billion U.S. dollars. In the United States, resources, technology and practices are required to conform to local building codes and regulations. For example, construction materials (e.g. bricks, stones, or timber) that are to be used are usually dictated by the materials readily available to an area. Although projected consumption of cement in construction in the U.S. has continued to rise since the economic downturn, wood-framed construction is considered one of the most popular methods of residential construction in all of North America. Cost of construction may also vary based on site conditions, local regulations, and economies of scale. 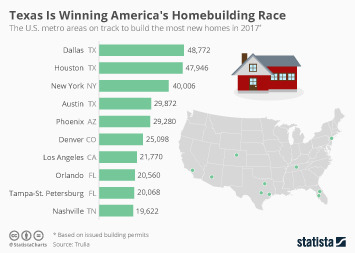 The Dallas-Fort Worth-Arlington metropolitan area was ranked as having the highest value for new residential construction in 2017. The construction cost for high rise apartments in New York City stood at 3,250 U.S. dollars per square mile in 2018. In recent years, new technologies and methods of construction intended to improve efficiency, performance and reduce construction waste have continued to emerge. As an example, advances in 3D printing technology—a form of additive building construction similar to additive manufacturing techniques—is now making it possible to flexibly construct small commercial buildings and private habitations within a relatively short amount of time. Under current trends of sustainable construction, revenue generated from the green and sustainable building construction industry has continued to rise steadily.